Samsung UE48H6400 review | What Hi-Fi? Have you come across a 48in LED/LCD screen before? We certainly hadn't when we tested this set. The Samsung UE48H6400 is the first of this new screen size, and we like it. A lot. Sharp, clear and full of subtle detail that’s impressive at this mid-range price, the Samsung '6400's picture hooked us in from the minute we turned it on. At £700 (down from £1000), this could be the best TV deal we’ve seen this year, what with its smart build and numerous features. High-definition pictures burst with clarity and crispness, and the screen has a beautifully judged colour palette; full of depth, subtlety and punch. Black areas are deep, yet still have subtle detail. It’s a superbly detailed picture for the price and looks fabulous with our Blu-rays of Pacific Rim, Thor 2 and other blockbuster films. We barely feel the need to tweak the picture settings either, as the screen feels pretty right, straight out of the box. Formula One cars race around the Spanish Grand Prix track as the Samsung TV handles the fast-moving motion with confidence and smoothness. The whites of the racetrack kerbs are stark and bright, while the glossy finish of the cars glisten in the sunlight. The UE48H6400 is adept at rendering reds, which are vibrant and subtle. Skin tones look natural, making rivals like the Sony KDL-50W829B and Philips 55PFS6609 look unconvincing in comparison. The '6400 is one of the cleanest pictures we’ve seen this year for both Full HD and DVD. The upscaling is good, with plenty of detail, despite the lower resolution. Its smooth motion and strong contrast translates well on 3D films, too. The 3D depth in the Blu-ray of Life of Pi is immersive and crystal-clear detail makes it compelling (Samsung includes two pairs of active glasses). The Samsung sound is good as well: nicely rounded and clear, and it has decent weight. It's not as spacious and open as LG 47LB730V, mind you, and it’s not quite the effect of a home cinema system, so a decent soundbar would work well here. Samsung’s smart TV portal remains largely unchanged, which is no bad thing. There are tweaks across the interface, but the speediness remains the same. Samsung's 'For You' recommendation service is a nice mix of mainstream and personalised content – all laid out in a coherent grid and it works very well. Less than a day into our test, the UE48H6400 began suggesting relevant programmes and online content to watch. You also get a wealth of catch-up services (ITV Player, 4oD, Demand 5) as well as Netflix, BFI Player, Vimeo and YouTube. Curiously, BBC iPlayer is still missing, but we are assured it’s only an update away. TuneIn and vTuner internet radio are also available, alongside the usual social network apps. Samsung’s ‘Football Mode’ differs from Sony’s by offering to record football highlights based on crowd noise. The setting, however, is garish in both picture and sound, so we would steer clear of activating it. Samsung’s standard remote makes navigation second nature, but we’re less enthused with the new pebble-shaped smart touch remote. The touchpad is too small, while the pointer needs a steady hand. And we still don’t enjoy voice interaction. The '6400 has a decent array of connections on the back, with four HDMI inputs and three USB ports. You also get an input each for component, composite and scart, and an optical audio output. For internet, you can go wired or wireless, and a Freeview HD tuner takes care of your broadcast TV. 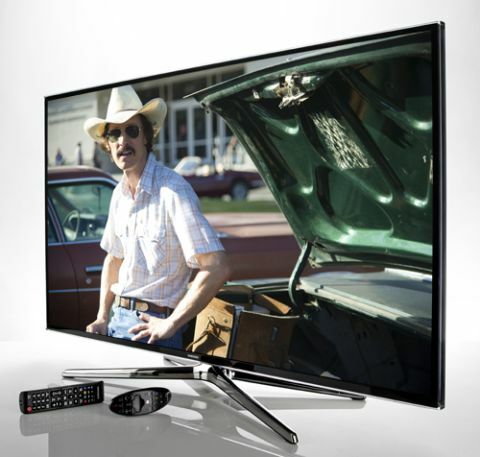 Is this 48in Samsung screen one of the best TV deals of the year so far? We certainly think so. Samsung’s picture quality has been pleasingly fuss-free this year, as we’ve also seen on the higher-end UE65H8000, and they’ve toned down that slightly overdone, eye-popping dynamic picture of years past. It’s a subtler, more controlled and balanced picture, and we think that the TV giant has got this year’s approach just right.